A woman with hypertension refuses vegetables. A man with diabetes adds iron-fortified sugar to his coffee. As death rates from heart attacks, strokes, and diabetes in Latin America escalate, global health interventions increasingly emphasize nutrition, exercise, and weight loss—but much goes awry as ideas move from policy boardrooms and clinics into everyday life. 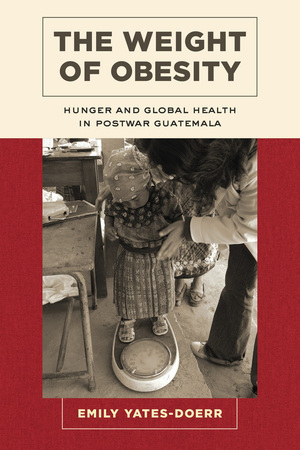 Based on years of intensive fieldwork, The Weight of Obesity offers poignant stories of how obesity is lived and experienced by Guatemalans who have recently found their diets—and their bodies—radically transformed. Anthropologist Emily Yates-Doerr challenges the widespread view that health can be measured in calories and pounds, offering an innovative understanding of what it means to be healthy in postcolonial Latin America. Through vivid descriptions of how people reject global standards and embrace fatness as desirable, this book interferes with contemporary biomedicine, adding depth to how we theorize structural violence. It is essential reading for anyone who cares about the politics of healthy eating.